Appi Kogen is a resort area in the north west region of Iwate Prefecture, northern Honshu. Located on Mt. Maemori and Mt. Nishimori in the Hachimantai National Parkabout 50km north of Morioka City, Appi Kogen is a popular resort area throughout the year. Most importantly for us, it is also one of the largest and well-known ski and snowboard resorts in the Tohoku region of Japan. A few smaller ski resorts are located in the northern region of Iwate Prefecture. The closest station to Appi Kogen is Appi Kogen Station. To get to that station from Morioka Station take the Hanawa-sen direct. Bus services are also available from Morioka Station, Sendai Station and Hanamaki Airport (see below for more information). Take the Tohoku Shinkansen to Morioka Station. Take the Sendai Airport Line train into Sendai Station (about 7km) and then transfer to the Tohoku Shinkansen to Morioka Station. * A shuttle bus directly from Sendai Airport to Appi Kogen is available for guests staying at the resort hotel - a journey that takes around 3 hours. From Morioka Station take the Hanawa line to Appi Kogen Station. The Hanawa line is a JR line that links Koma Station in Morioka and travels further north into Akita Prefecture. Trains from Morioka Station to Koma Station actually operate on the Iwata Ginga Tetsudo-sen (IGR) lines... but run striaght through from Morioka Station to Appi Kogen Station without the need for a transfer. The journey from Morioka Station to Appi Kogen Station takes around 1 hour. This journey from Tokyo Station to Appi Kogen Station is around 602km and usually takes around 200 minutes. A shuttle bus is available running between Appi Kogen Station and Appi Kogen resort. The bus service is free for guests staying at the resort hotel and costs 210 yen for other guests. Note that Appi Kogen Station is a small, unmanned train station with no rental car or taxi rank facilities. More bus information can be found below. >> On the above map click on the resort name, train line and expressway name for more details. A bus service is available that operates direct from Morioka Station to Appi Kogen. Services run daily and the journey takes around 45 minutes. The charge is 1,130 yen for adults and 570 yen for children (Friday night service slightly more expensive). The APPI Airport Liner and Taxi from Hanamaki Airport operates from 9:50am daily in the main season and costs 2,260 yen one way. A bus also operates from Sendai Station during most of the peak season leaving the station at 9am. This bus is free for Appi Hotel guests. Reservations are required four days before check-in. The times shown below are simple guidelines to indicate the train journey times between the stations mentioned and may vary depending on the trains and connections used. The lower number indicates travel time, the higher number indicates a sample journey including connecting times. Times from stations to ski resort areas are not included. Please check for specifics. 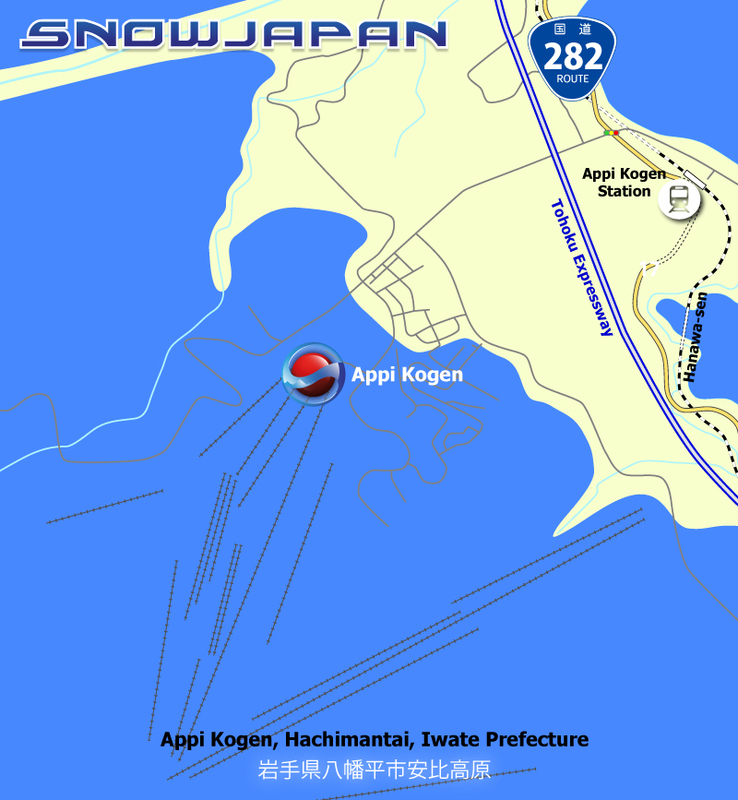 For detailed information on how to get to Appi Kogen by car, please go to this section.